As OpenStack has continued to mature, it has become more complicated in some ways but radically simplified in others. From a deployers view, each service has become easier to deploy with more sensible defaults and the proliferations of cloud distributions. However, the architects view of OpenStack has actually gotten more complicated – new services have been added and new ways of integrating them are now feasible. As an aid to architects that are new to OpenStack, this post updates my OpenStack Folsom Architecture blog and revisits my Intro to OpenStack Architecture (Grizzly Edition)presentation from Portland, with a few clarfications and updates. Object Store (codenamed “Swift“) allows you to store or retrieve files (but not mount directories like a fileserver). Several companies provide commercial storage services based on Swift. These include KT, Rackspace (from which Swift originated) and Hewlett-Packard. Swift is also used internally at many large companies to store their data. Image Store (codenamed “Glance“) provides a catalog and repository for virtual disk images. These disk images are mostly commonly used in OpenStack Compute. Compute (codenamed “Nova“) provides virtual servers upon demand. Rackspace andHP provide commercial compute services built on Nova and it is used internally at companies like Mercado Libre, Comcast, Best Buy and NASA (where it originated). Dashboard (codenamed “Horizon“) provides a modular web-based user interface for all the OpenStack services. With this web GUI, you can perform most operations on your cloud like launching an instance, assigning IP addresses and setting access controls. 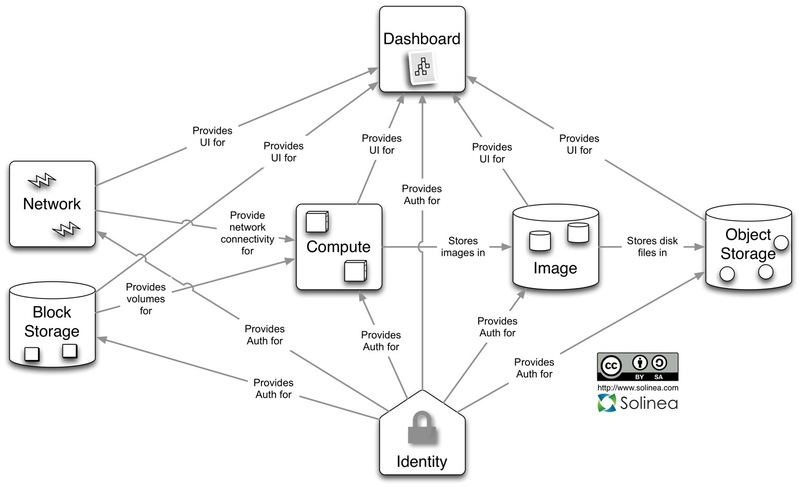 Identity (codenamed “Keystone“) provides authentication and authorization for all the OpenStack services. 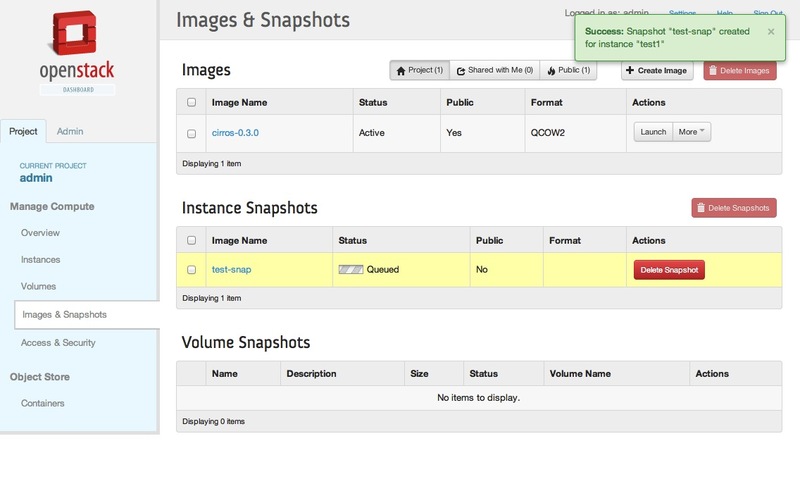 It also provides a service catalog of services within a particular OpenStack cloud. Network (which used to named “Quantum” but is in the process of being renamed due to a trademark issue) provides “network connectivity as a service” between interface devices managed by other OpenStack services (most likely Nova). The service works by allowing users to create their own networks and then attach interfaces to them. Quantum has a pluggable architecture to support many popular networking vendors and technologies. Block Storage (codenamed “Cinder“) provides persistent block storage to guest VMs. This project was born from code originally in Nova (the nova-volume service that has been depricated). While this was originally a block storage only service, it has been extended to NFS shares. In addition to these core projects, there are also a number of non-core projects that will be included in future OpenStack releases. Network provides virtual networking for Compute. Block Storage provides storage volumes for Compute. This is a stylized and simplified view of the architecture, assuming that the implementer is using all of the services together in the most common configuration. However, OpenStack does not mandate an all-or-nothing approach. Many implementers only deploy the pieces that they need. For example, Swift is a popular object store for cloud service providers, even if they deploy another cloud compute infrastructure. 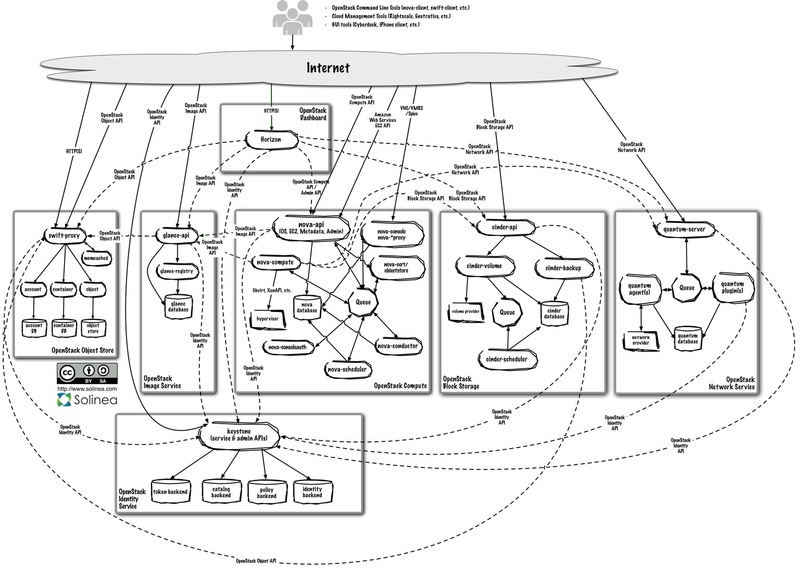 The diagram also only shows the “operator” side of the cloud — it does not picture how consumers of the cloud may actually use it. For example, many users will access object storage heavily (and directly). Horizon is a modular Django web application that provides an end user and cloud operator interface to OpenStack services. The Horizon architecture is fairly simple. Horizon is usually deployed via mod_wsgi in Apache. The code itself is separated into a reusable python module with most of the logic (interactions with various OpenStack APIs) and presentation (to make it easily customizable for different sites). There are several changes to the architecture in this release. These changes include the depreciation of nova-network and nova-volume as well as the decoupling of nova-compute from the database (through the no-compute-db feature). All of these changes are all optional (the old code is still available to be used), but are slated to disappear soon. nova-api is a family of daemons (nova-api, nova-api-os-compute, nova-api-ec2,nova-api-metadata or nova-api-all) that accept and respond to end user compute API calls. It supports OpenStack Compute API, Amazon’s EC2 API and a special Admin API (for privileged users to perform administrative actions). It also initiates most of the orchestration activities (such as running an instance) as well as enforces some policy (mostly quota checks). Different daemons allow Nova to implement different APIs (Amazon EC2, OpenStack Compute, Metadata) or combination of APIs (nova-api starts both the EC2 and OpenStack APIs). The nova-compute process is primarily a worker daemon that creates and terminates virtual machine instances via hypervisor’s APIs (XenAPI for XenServer/XCP, libvirt for KVM or QEMU, VMwareAPI for VMware, etc.). New to the Grizzly release is the return of Hyper-V (thanks to the Cloudbase Solutions guys for the comment). The process by which it does so is fairly complex but the basics are simple: accept actions from the queue and then perform a series of system commands (like launching a KVM instance) to carry them out while updating state in the database through nova-conductor. Please note that the use of nova-conductor is optional in this release, but does greatly increase security. The nova-scheduler process is conceptually the simplest piece of code in OpenStack Nova: take a virtual machine instance request from the queue and determines where it should run (specifically, which compute server host it should run on). In practice, it is now one of the most complex. A new service called nova-conductor has been added to this release. It mediates access to the database for other daemons (only nova-compute in this release) to provide greater security. The queue provides a central hub for passing messages between daemons. This is usually implemented with RabbitMQ today, but could be any AMPQ message queue (such as Apache Qpid), or Zero MQ. Nova also provides console services to allow end users to access their virtual instance’s console through a proxy. This involves several daemons (nova-console,nova-xvpvncproxy, nova-spicehtml5proxy and nova-consoleauth). Serve static web pages and objects via HTTP. In fact, the diagrams in this blog post are being served out of Rackspace’s Swift service. There are also a number of periodic process which run to perform housekeeping tasks on the large data store. The most important of these is the replication services, which ensures consistency and availability through the cluster. Other periodic processes include auditors, updaters and reapers. Authentication for the object store service is handled through configurable WSGI middleware (which will usually be Keystone). To learn more about Swift, head over to the SwiftStack website and read their OpenStack Swift Architecture. The Glance architecture has stayed relatively stable since the Cactus release. and software. As such, the architecture and deployment can vary dramatically. appropriate quantum plugin for action. Linux bridging and the Ryu Network Operating System. Midokua also provides a plug-in for Quantum integration. The common agents are L3 (layer 3), DHCP (dynamic host IP addressing) and vendor specific plug-in agent(s). database to store networking state for particular plugins. connectivity for its instances. Florian Otel has written very thorough article on implementing Open vSwitch is you are looking for an example of Quantum in action. It’s architecture follows the Quantum model, which provides for a northbound API and vendor plugins underneath it. storage providers through a driver architecture. Currently, there are included drivers for IBM (Xiv, Storwize and SVC), SolidFire, Scality, Coraid appliances, RADOS block storage (Ceph), Sheepdog, NetApp, Windows Server 2012 iSCSI, HP (Lefthand and 3PAR), Nexenta appliances, Huawei (T series and Dorado storage systems), Zadara VPSA, Red Hat’s GlusterFS, EMC (VNX and VMAX arrays), Xen and linux iSCSI. block storage provider node to create the volume on. cinder-backup is a new service that backs up the data from a volume (not a full snapshot) to a backend service. Currently, the only shipping backend service is Swift. information between the cinder processes as well as a database to store volume state. Ceilometer is a metering project. The project offers metering information and the ability to code more ways to know what has happened on an OpenStack cloud. While it provides metering, it is not a billing project. A full billing solution requires metering, rating, and billing. Metering lets you know what actions have taken place, rating enables pricing and line items, and billing gathers the line items to create a bill to send to the consumer and collect payment. For users that also want a billing package, BillingStack is another open source project that provides payment gateway and other billing features. Ceilometer is available as a preview now. Reddwarf is a database as a service offering that provides MySQL databases within OpenVZ containers upon demand. Ironic is the aptly named project that uses OpenStack to deploy bare metal servers instead of virtualized cloud instances.